The lemon tree in our backyard has just a few lemons remaining. It is a small one but always yields a ton of fruit. Having such a tree at our disposal means having a supply of fresh organic lemons when in season. I recently discovered that the lemon leaves have a place in the food scene as well with teas or when grilling meats. The leaves themselves are not edible but can impart a lemon like flavor, much like kaffir lime leaves. I decided to combine a few of my favorite ingredients together with two of the lemons for a flavorful bright meal. I love the wonderful zing and brightness that citrus brings to food. Here shrimp and asparagus are drizzled with fresh lemon juice, honey, olive oil and parsley and served on a bed of whole wheat couscous. Bring 2 cups water to a boil in medium-sized saucepan. Remove from heat, add couscous, 1/8 teaspoon salt and pepper, stir quickly, cover with lid and let stand 5 minutes. Fluff couscous with fork and 1 tablespoon lemon juice, set aside. Combine 1 tablespoon of lemon juice, olive oil, shallots, 1/8 teaspoon salt and pepper. Add shrimp. Let sit for 5 minutes. Preheat a grill pan or grill. (I used a grill pan that covered two gas burners). Toss asparagus lightly in 1 teaspoon olive oil. Add to grill and grill until your desired tenderness. (I like mine crisp-tender) Remove from pan, set aside. Grill shrimp, turning in 2 to 3 minutes, depending on the size of the shrimp. Whisk together honey, parsley, remaining lemon juice and olive oil. Place a scoop or two of couscous on each plate, add asparagus and shrimp, drizzle with citrus sauce. Enjoy! This looks like a delicious springtime dish! Thanks Amy, we enjoyed this very much, love whole wheat couscous. I can't resist such a wonderful zesty yummy meal ! Thanks Karen, you are so sweet. Thanks Dena, as you can see there is only a few left, but we had a great bounty this year. How wonderful that you have your own lemon tree! The citrus sauce in this recipe sounds great, too! Thanks Nancy, it is a wonderful tree. Thanks Janet, appreciate you stopping by. Thanks Louise, it is the best tree, sometimes I drink water with lemon slices in it. Cheri, this sounds like a delicious, light meal! Honey and lemon are magic together and I will definitely be making this. Thanks Marcelle, hope you enjoy this as much as we did. Lemon trees love the heat so I don't think that you would have a problem, take care Tandy. This sounds like such a flavorful, light meal, Cheri! I love the ingredients you've put together. Isn't it nice to have a lemon tree in your own backyard? We really enjoy ours. Thanks for sharing your recipe! I know we are kind of spoiled aren't we Shari, take care. It's my long-term ambition to own a lemon tree some day! How wonderful that you have one! 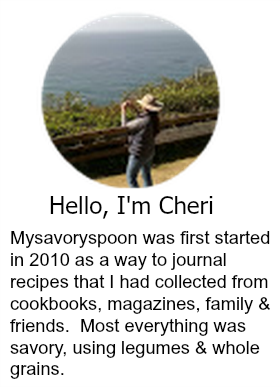 I love every recipe you make, Cheri - your recipes are always up my alley. But this one - well, I would order it from a restaurant menu. Delicious! Thanks Helen, you are so sweeet. Cherie - I can never get enough citrus! I am still posting lemon recipes, too! This is a wonderfully flavorful and healthy recipe - perfect for a midweek meal! Thanks David, we are pretty lucky aren't we....Take care and have a great week. Thanks Liz, it is a wonderful tree. Wow! Cheri, I am loving this gorgeous platter. Such a hearty meal with full of awesome flavors! Thanks Monica, citrus season is just about over, we only have a few left. I miss all the citrus we grew when we lived in Florida. Tons of oranges, limes, and Meyer lemons. I envy you! Anyway, shrimp, citrus, and olive oil are such a great combo. This looks spectacular -- thanks so much. Thanks John, I have never been to Florida, it's on my list. But I have heard about the citrus groves. Take care. Homegrown lemons..how cool is that!! Shrimp and asparagus...both are my favourites. Thanks Angie, appreciate you stopping by. 2 of my favourites right here, asparagus and lemons! I love citrus, especially lemons and even though they are a winter fruit, they go so well with springtime. Love this dish, Cheri. Thanks Nazneen, me too, when I think of springtime I always think of lemons. This dish looks so good - love prawns and asparagus, so together, a match made in heaven. Thanks Gaye, I think they are to. Cheri, hail springtime cuisine - your dish looks so delightfully seasonal! Thanks Andrea, it's heating up here, today should be in the nineties. Thanks Kim, I do feel pretty lucky, lemons always seem to brighten up a dish. I am so jealous that you have a lemon tree. I would love one, especially as we use lemon in so many of our dishes. Thanks Dannii, fresh lemons can brighten up any dish. i wonder if we could grow lemon trees here in charlotte. that'd be awesome. speaking of awesome, this is a great dish! Not sure Grace, I know that they love the sun. Take care. I must spend a fortune on lemons every year! You are very lucky to be able to grow them, Cheri, and this dish looks incredibly delicious! Thanks Susan, during the summer we pay a pretty penny, sometimes almost a dollar each. 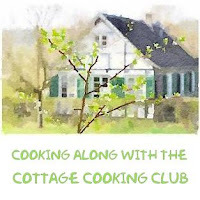 Thanks Robyn, I thought this recipe might get your attention, take care!